Here’s the latest on celebrity restaurants at Disney Springs – plus the all the updates on news, weather, and closings this week at WDW. Guy Fieri stopped by Disney Springs recently for the grand opening of his new Quick Service Restaurant, Chicken Guy! The newest Disney Springs eatery features a variety of chicken, of course, along with salads and desserts. You’ll want to make sure you try one (or several) of the 22 house-made sauces while you’re there. 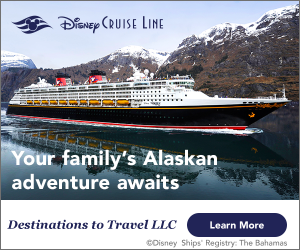 Have you had the chance to visit yet? Be sure to stop by our Facebook community and let us know what you think! 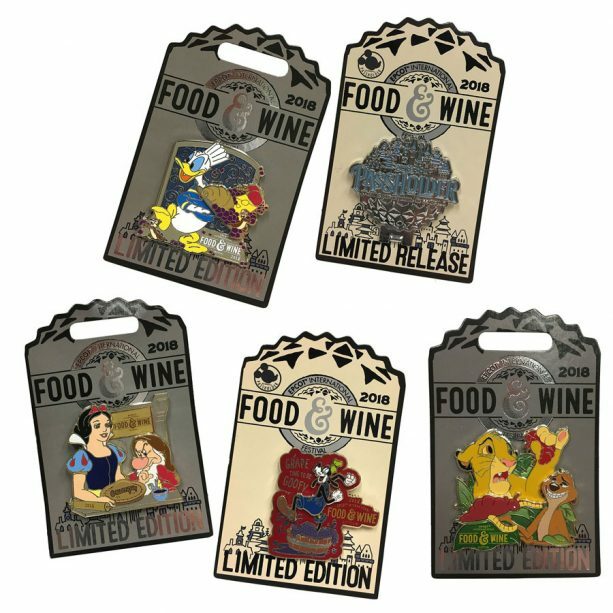 Pins from the 2018 Epcot International Food & Wine Festival. Image Courtesy of Disney Parks Blog. The delicious food and thirst-quenching beverages are certainly the main reason to visit the Epcot International Food & Wine Festival. But, you’ll want to pay attention to some really tempting merchandise too! There’s a really nice burgundy hue complementing many of the souvenirs this fall, and the cutest just might be the mouse ears. They have a simple elegance about them. If you’re looking more for functionality, you might find the mugs, bowls, and salt and pepper shakers irresistible. Be on the lookout for hats, shirts, and bags (including Dooney) along with limited edition pins. 2018 Epcot International Food & Wine Festival Disney Gift Cards. Photo courtesy of Disney Parks Blog. Also returning this year to the Food & Wine Festival are the handy, wearable give cards that allow you to easily swipe then sample the tasty offerings throughout World Showcase. Chef Remy is the featured character available through three different designs. The gift cards must be activated with the minimum of $15 and can be reloaded. 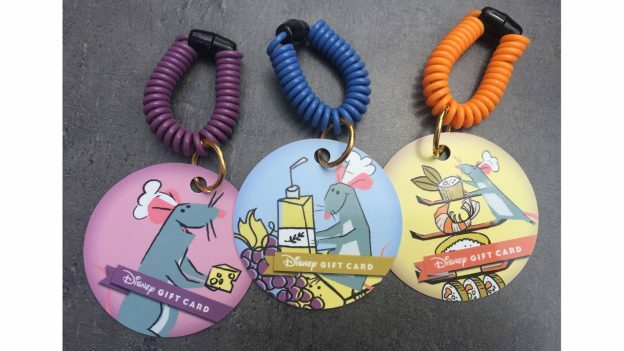 If you’re more of a traditional gift card type of person, and you know you will be purchasing a lot of food, consider splurging on the limited-release $250 gift card that comes with a special lanyard featuring Chef Mickey. 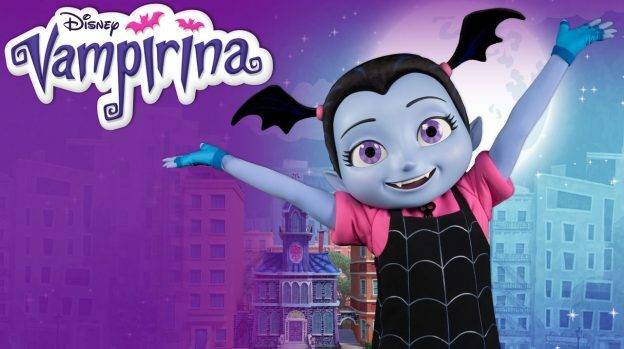 A new character has arrived at Mickey’s Not-So-Scary Halloween Party, and her name is Vampirina! She will be dancing the night away at Storybook Circus Disney Junior Jam, so head to Magic Kingdom if you want to see Vee! Disney After Hours, a special ticketed event giving you extra hours at Magic Kingdom, has added more dates. New dates include December 3 and 10; January 7, 17, 24, and 28; February 7, 14, and 28, and March 7. Advanced tickets are $125 plus tax per person and tickets the day of are $129 plus tax. Purchasing a ticket allows you to ride over 25 attractions with minimal wait while sampling all of the Mickey’s Premium ice cream bars you can eat! 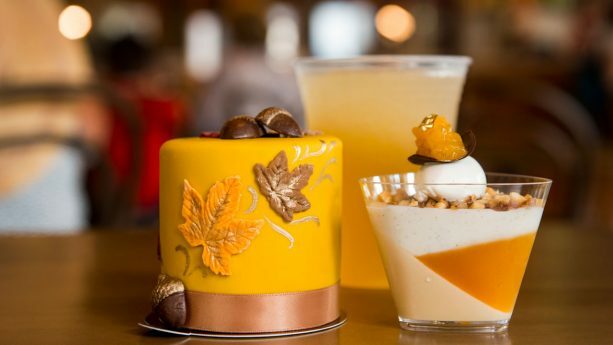 Caramel Apricot Cobbler, Fall Harbest Petit Cake, and Apple Cider Riesling Wine Slushie at Amoretteâs Patisserie for WonderFall Flavors at Disney Springs. Photo Courtesy of Disney Parks Blog. Since we’ve fallen quickly into September, Disney Springs is bringing you all of the fall tastes you can image! Over 14 restaurants (both table and quick service) are conjuring up some great comfort foods. YeSake is offering a Harvest Fresh Bowl with chicken, spinach, kale, cranberries, and a sweet Vidalia dressing. Enzo’s Hideaway has a Fall Harvest Soup created with roasted apple and winter squash. You won’t want to miss the Bavarian Roasted Pork Shanks tossed in an Oktoberfest beer sauce at Jock Lindsey’s Hangar Bar. And this is just the tip of the WonderFall Flavors at Disney Springs! Make sure you stop by the Disney Springs Welcome Center for a booklet on all of the amazing treats. The event runs through November 6th.